Are you fed up with your wet face and hair and with sweat running down all over you when you perform each of your workout activities? This issue is history if you get a good sweatband that will keep you dry and fresh while also looking amazing. Whether it is to prevent this problem, or simply to match accessories with your jogging outfit, if you take a look at the list we created below, surely you will get some ideas on picking the right one for you. The Suddora headbands are 80% cotton, 12% spandex, and 8% nylon, and they are available in multiple colors, including neon. Surely you will find at least one to your liking. Or you can get more than one, to complete each of your workout outfits. They are an excellent choice for blocking sweat from running down your face while you are at the gym, or jogging up the street. They are not only stylish for a great look but also comfortable to wear and maintain. The bands are easily washable, and they will not stretch. They come in 7-inch x 2 1/2-inch dimensions; one size fits all. Kenz Laurenz offers this pack of 12 cotton headbands of multiple colors, suitable for any type of sports activity such as volleyball, tennis, softball, basketball, soccer, jogging, or yoga. They are very flexible, with a 2-inch width and a 6.5-inch length. They maintain their shape and do not stretch after repeated wearing and washing. The bands are highly absorbent and soft, offering you a maximum level of comfort while wearing them. You can use them to prevent sweat from running down on your face, for completing your workout equipment, or maybe just one that matches your jogging pants or T-shirt for the day. Working out is a worldwide phenomenon that never gets out of style. We usually try to fit going to the gym into our daily schedules, but we also want to look great while performing. Sweat dripping from the hair into the eyes and face is definitely not trendy. The Temple Tape headbands absorb and wick away moisture eight times faster than a traditional cotton sweatband. The specially combined materials offer a good grip and a non-slip experience, allowing you to concentrate on your activity rather than worrying that your band will slip. These items will keep your head dry and fresh, offering you a great look. The Suddora headbands are available in multiple colors. They are great to use during basketball, jogging, cycling and many other sports activities. They are made of an ultra-high-quality material to prevent irritations to your head. You can wear your band for as long as you need during your gym sessions. This item is sold in two different models – Rainbow and Red, and White and Blue Striped. The bands are made from cotton in a proportion of 80%, 12% Spandex, and 8% Nylon. They are very comfortable, but also durable. They should fit anyone perfectly, with measurements of 7-inch in length and 2-inch in width. The Halo I model is the unique headband that started it all. It was designed to tie in the back in order to provide a custom fit for each user. It includes all the features that made Halo Headbands a leading name on the market. The patented Sweat Seal Grip Technology and Dryline Fabric make this item popular with runners, cyclists, lacrosse player, and any athlete searching for a custom fitted band. Made from high-quality materials, they will not stretch out and lose shape. In addition, the Grip Technology holds the sweatband in place throughout your entire workout session. Under Armour is a globally renowned name in the sportswear world. From shoes to clothes and other accessories, all of their products are highly appreciated. The Men’s Performance Headband model is no different. The high-quality material, constructed in multi-channel performance fibers (96% Polyester and 4% Elastodiene), is super breathable and wicks sweat like it’s something else. It also dries quickly and regulates body temperature. The bands come with the embroidered Under Armour logo, common for all their products. If you want to feel fresh, dry and light, wear this sweatband with confidence, as you will not regret it. Happy jogging! The NIKE Swoosh headband comes with the embroidered Swoosh logo. You can easily keep the sweat out of your eyes and face with this item. The comfortable headband is perfect for any sport you might practice. Made from cotton, nylon, and rubber in proportions of 69%, 26%, and 5%, is easy to care for, and it is machine washable. It comes with a 2-inch width, perfect for any person. The item fits comfortable and absorbs sweat like a champ. Although it is very flexible, the NIKE Swoosh headband will stay put on your head, allowing you to enjoy your gym class, without any worry of slipping. The Halo II is the best-selling headband from this manufacturer. It features the Dryline fabric and the patented Sweat Seal Grip Technology. This athletic headband redirects moisture and sweat away from your eyes, face, or glasses. This model of sweatbands is great for cycling, running, or virtually any other activity that will make you sweat. It fits comfortably under helmets, and it is suitable for both men or women. No matter how much you wear them, these bands will not lose shape or stretch out. With this product, you can forget about the feeling of burning sweat in your eyes. In case you are searching for a headwear product that stays in place, absorbs sweat and has a soft feel, you should give this alternative a try. This product is developed in such a manner to meet your high expectations and to ensure that you perform your physical activity with confidence. Due to the sweatband’s non-slip unique fabric blend, you will have no more issues with intense sweat. This product is also ideal for women who prefer styling their hair with a fashion hairband, for any other daily activities. Surely, you will not regret giving a shot to this type of headband. Sports and workout sessions are not the only activities that can make sweat run down your face. Before you start making any assumptions, we are referring to the workers who perform their activities in harsh conditions and wear helmets, like welders, for example, who encounter this issue as well. Weldas comes with a pack of two hard hat sweatbands. They not only absorb sweat and improve the helmet grip, but they are also flame retardant treated, for added safety. They feature a Velcro closure and hook and loop for a universal fit. Forget about the sweat that runs from under your helmet, and get the SWEATSOpad. It’s becoming more and more difficult to get new gifts for runners or just any type of equipment, for that matter. All of this is due to the fact that the market is overflowing with choices, most of which are usable and made of quality materials. That’s why you might find it challenging finding the best sweatbands out there. Even if you’ve gone through dozens of sweatbands reviews, you might not have found a perfect model, and one that speaks to your needs, looks good and allows you to feel at ease while you tend to your physical exercise routine. Besides, if you’re on a budget, you might be searching for good sweatbands for the money, which is a different matter altogether given that you also have to pay attention to the seams and general construction of the item so as to make sure that it is capable of withstanding the test of time. You’re probably looking for a product that looks cool, but also serves you for a decent amount of time. If you aren’t interested in getting the item for yourself, the matter’s even more complicated as you need to ensure that you are able to choose the right size and design. The fact that a sweatband looks good shouldn’t be the only factor that you take into consideration when deciding between one model and the next. To find out more about the other aspects you ought to take into account, we suggest reading our buyer’s guide. What’s the type are you looking for? 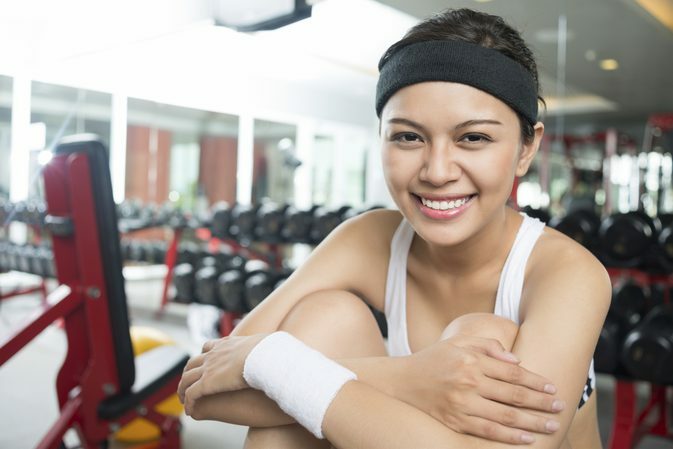 While the whole idea of a sweatband usually refers to the best wrist sweatbands, some people might look for those that can be worn on your head. Therefore, the first step you should take if you want to make sure that you are able to select the right model for your expectations is to determine your requirements. A simple Google search about the best head sweatbands will turn up millions of results. The point that we are trying to make is that it sometimes boils down to your specific preferences and the way you intend to utilize the product you’re going to spend your cents on. While the looks of the unit are definitely important especially are you’re in the market for cool alternatives, the way that it was designed and constructed is considerably more important. Some prospective buyers tend to think that synthetic fabrics are better as they are made to be durable. While this concept isn’t wrong, synthetic materials are anything but breathable. In fact, some might even make you sweat more. It goes without saying that your comfort matters a whole lot while you’re running, and so we suggest getting a model that is made of a mix of cotton and something else. We do not recommend sweatbands made solely of cotton as it isn’t a good choice in the long run. A simple washer cycle can ruin a cotton sweatband, stretch it, or just make it less usable gradually. Depending on the kind of sweatband you’re in the market for, you need to look at the circumference of your head or your arm. Many models are available in universal sizes, but this isn’t a good idea considering that the body shape of joggers differs significantly from one person to the other. Aside from this, you should determine whether you’d prefer using a longer or a shorter sweatband. In theory, a longer alternative makes it possible for the unit to absorb more sweat. However, it depends on the model that you will end up choosing given that the features of thousands of choices are unique in many respects. If you are looking to purchase the sweatband for yourself, your decision-making process is considerably more straightforward compared to how it would be if you were to get it for another person. In this last case, you’d have to perform a running gifts comparison, especially if you aren’t resolute on getting a sweatband per se. The factors that we have highlighted above also apply if you’re buying the product for someone else, which is to say that the fabric that it’s made of, the size and length, as well as the design all matter quite a bit. Don’t forget to consider the color and looks of the product, especially if the individual you are getting the gift for is into eye-catching apparel. Of all of the questions you should ask yourself when you’re trying to find the right choice for you, this one is particularly important. In fact, you should try to come up with an answer to this question whenever you’re trying to purchase something, whether it is a mobile device, an appliance, a piece of clothing, or anything else. With things that you might use somewhat rarely, the manufacturing brand might matter less or not at all. However, sweatbands are made to be worn rather regularly considering that joggers go out and run at least two to three times per week. A model designed by Under Armour, Adidas, or Nike, has a better chance of meeting your requirements in terms of comfort and durability. Fortunately, most of the products that we have come across and that are available for sale these days are more or less affordable. Those that could cost a bit more are sets that include two sweatbands for both of your hands and one designed for your head. The better the product in terms of quality and durability, the pricier it should be. While some sweatbands cost less than ten dollars, others could be as expensive as twenty and even more. Of course, as is the case with any other type of product, the sky’s the limit when it comes to how pricey an item can be. At the end of the day, your comfort matters most. You will be the one using the product, so never forget that.